Update 6/23: Property rights lost 5-4. More on Kelo decision here and here. The arguments below are still valid, even if the SCOTUS did not agree. Justice Antonin Scalia asks what difference it makes that New London is depressed. What if a city acknowledged that it wasn't doing badly, but just wanted to condemn land to attract new industry? He describes Horton's position as: "You can always take from A and give to B, so long as B is richer." And O'Connor offers this concrete example: What if there's a Motel 6 but the city thinks a Ritz-Carlton will generate more taxes? Is that OK? "So you can always take from A and give to B if B pays more taxes?" asks Scalia. "But that will always happen. Unless it's a firehouse or a school," protests Kennedy. "We're paying for it!" Horton exclaims, noting that no one is taking anything from these minorities. "But you're taking it from someone who doesn't want to sell. She doesn't want your money," retorts Scalia. Put simply, cities cannot take someone's house just because they think they can make better use of it. Otherwise, argues Scott Bullock, Mrs Kelo's lawyer, you end up destroying private property rights altogether. For if the sole yardstick is economic benefit, any house can be replaced at any time by a business or shop (because they usually produce more tax revenues). Moreover, if city governments can seize private property by claiming a public benefit which they themselves determine, where do they stop? If they decide it is in the public interest to encourage locally-owned shops, what would prevent them compulsorily closing megastores, or vice versa? This is central planning. Plenty more commentary at Professor Bainbridge (here and here), Volokh (here and here), Cafe Hayek, and the Knowlege Problem. The Institute for Justice is defending the property owners and is at the forefront of this fight - win or lose, they deserve props for their efforts. Postscript: I generally don't like the arguments I see in some blogs that go like "why aren't the ___________ [fill in with liberal or conservative] blogs addressing such-and-such issue?" Blogs are intensely personal, and since most of us write them as a hobby, there are always going to be issues that just don't really get us fired up. For example, though many libertarian bloggers expend numerous electrons on gun rights, the topic is generally a yawner for me so I seldom go there. ... a growing number of governments are using eminent domain to circumvent the conventional real estate market. Eminent domain forces property owners to sell their property to the city while the city then turns around and sells the property to developers. Private developers can reap significant financial gains through this process. Reason finds these decisions are increasingly driven by local politics, not respect for property rights, and give well-connected property developers significant advantages over homeowners and small businesses. Little guy vs. big guy -- where is the Left? Well, the problem is that progressives generally support the erosion of private property rights. They like cases that reinforce the ability of government and politicians to take, redirect, or otherwise control private property for their own goals. In this case, I presume that they are willing to sacrifice a few little guys in Connecticut for the larger goal of increasing statism. The moment of the day came in Kelo when the city's counsel attempted to close by saying, "I want to leave you with just four words," then his time expired. (Although he did say -- using more words, "I see my time has expired so I won't be able to tell you them.") Justice Kennedy then asked the plaintiff's lawyer on rebuttal, "You don't happen to know what the four words were?" Regrettably, he didn't. 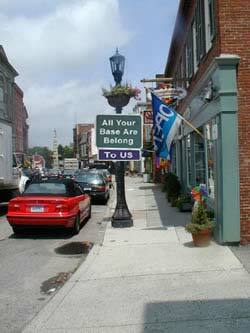 Here is my guess for New London's last four words: "Everything belongs to us". Of course "All your base are belong to us" would have been better, but that is seven words. Yikes! You track back to the birdbrain oxymoron (catholic law professor - that's like a vegetarian butcher!). Aside from the fact that most of his posts are limp-lobed, right wing christian bulloney, he's got the nerve to beg for money - this from a law professor who drinks $50 bottles of wine. That's a lot of chutzpah for a chubby catholic! "limp-lobed, right wing christian bulloney"
Care to give one example? Much less 2? "he's got the nerve to beg for money"
Um, if you actually, you know, READ what he wrote, it's an offer to cover a topic in return for money. That is, a service for a fee. Nifty concept... might have an effect on society someday. "That's a lot of chutzpah for a chubby catholic!" As usual from a self-described lefty - never be bigoted or insult someone's religion... unless they are a Christian. What, exactly, did that bigoted, extraneous statement have to do with the topic at hand, other than being prejudiced against Christians (catholics in particular)? Oh, that's right, the left is the side of "tolerance". You mentioned "... it is interesting to speculate where the "progressives" are on this case. When you see a story of a city making a virtue of taking from poorer people to give to rich developers, one would expect the left to go nuts." Check out Crooked Timber's (which I think qualifies as progressive) post on this subject and read the threads (CT's treads are great...even if you don't agree with them). As you might guess, they were all against New London. It seems no one in the blogosphere likes New London. Btw, I just found this blog and I think it is great. SCOTUSblog reported later that the mystery four words were "federalism, boundaries, discretion, and precedent". According to the article in the New London Day today, the attorney's stated afterwords that his four words were "federalism, boundaries, discretion and precedent, all words that would encourage the court to stick with history and respect the rights of state courts and state legislatures to define proper uses of eminent domain." The Constitution's Fifth Amendment allows governments to seize private property in a process called eminent domain, as long as the owners receive "just compensation" and the property is for "public use." Actually, he begs for money in many places. The vast majority of academic bloggers don't hold out a tin cup asking for cash for doing what they are paid to do. I'll refrain from commenting on whether the verbiage on his site can be viewed as a "service." As usual from a self-described lefty - never be bigoted or insult someone's religion... unless they are a Christian. I never said people should not insult other people's religion - I think that if people believe things that are blatantly false, illogical and detrimental to society, it is ethical and justifiable to speak out about it. I believe the idea of a fundamentalist (that includes catholic!) christian law professor is an oxymoron. Law professors should base moral judgments on science and reason, not on an alleged book written by an alleged guy who lives in the sky. I am sorry if I am contradicting your stereotype of lefties as preaching tolerance - I am happy for christians to be intolerant of lesbians and I'm happy to return the favor. May I welcome back "nifty" from wherever it has been hibernating? Lurvly word. I even saw "slattern" the other day. Some personal favorites: Problems with eminent domain, thoughts on self-publishing a book, and a most peculiar solution to end-of-life medical care. The Supreme Court's decision to allow local governments to seize personal property in order to commercially develop is outrageous. Someone needs to organize a boycott against the businesses that develop that land, both on a local and on a national level (in the case of a national hotel chain). An organized threat of a boycott may make them think twice about continuing with this plan. I hope New Londoners will rally to face down the march of "national socialism" in their hometown. Maybe a Krupp munitions factory, with its own labor camp adjoined, built on the intellectually and morally blighted neighborhoods of the city council-persons would be a bigger economic and emblematic boon than the Pfizer development. This decision is so grossly unlawful as to merit action against the Supreme socialists. I am writing your office to express my enormous displeasure and disappointment in the recent supreme court rulings . The seizure of private property for one . The second is the right of sick people to use what ever drug a doctor deems appropriate for their treatment . Thirdly the whittling away of our protection of freedoms by articles of the patriot act . If I buy my own home take pride in it only to have it taken from me and given to a corporation for a for profit endeavor then we are slipping into a gray area between democracy and totalitarianism. Our personal rights are being eroded a little at a time. I never thought I would see the day when my home could be taken away from me and given to a corporation to make a profit and to make higher tax revenue for a city or government and profit for a corporation . Granted this is a boom for governments any development can result in seizure of property for making a bigger tax base and higher profits . This is a boom for the ones who have the greatest leverage with the cities and governments ,corporations and land developers. Those who have the least influence with governmental agencies will suffer the most common home owners. Here is a conflict of interest Governmental agencies can seize property sell to a corporation which builds a hotel the taxes created from the hotel would be greater than 20 single family homes . What better reason to seize property more money . Good bye to the great American Dream . The eminent domain clause was for PUBLIC usage what public usage is a corporate holdings a hotel jobs and more taxes . Ask what public use is most believe roads , railways, parks, libraries and other public buildings . Governments have a vested interest to allow this at the expense of the rest of us . The medical use of marijuana is a pharmacological issue not a legal issue The withholding medical treatment is considered cruel and unusual punishment These issues should be decided by the medical field and physicians rather than lawyers. Lawyers know the law . Doctors know physiology . The use of â€œto control interstate commerceâ€ as a reason to uphold the law barring the medical use of marijuana for sick people. This is a medical issue not a commerce issue . I feel that reasoning allows open-ended application of that reason This use can be expanded to other areas and I am sure will be expanded to any thing that could affect interstate commerce . Home gardens raising your own food affects interstate commerce ie I donâ€™t buy food which is affecting interstate commerce and subject to the controls of the federal government . The indefinite open-ended detention of US citizens or adversaries without charges breaks our fundamental rules of justice. The searches with out notification is secret searches . We as a people left those actions behind over 200 years ago . Only to be brought back now . William Blackstone said it's better for 10 guilty people to go free than for one innocent person to suffer . Our Nation was built on personal freedoms being foremost. Great leaders of ours created a wonderful constitution and bill of rights . Which is systematically being picked apart piece at a time . Many of the reasons the early America broke away from the crown of England are being undermined over time . The checks and balances between the people ,the government, the judicial branch and the executive branch are gradually being wiped away . Our nation is becoming what we left 200 years ago we are returning to the same tyrannical rule . The blood and lives of many were given to form a new government now 200 years later that government is returning to the same governmental actions they fought to leave . We the people of America have voted in politicians to serve our best interests of the majorities and protect the interests of the minorities . And this is happening . We need statesman to undo what has become of our freedoms and to protect us from future erosions of the Great Dream our forefathers envisioned of our country . I wonder how many would be turning over in their graves if they saw what has became of their Great Dream . I and many other Citizens of the US implore you and others in the Legislative bodies and Governorships to fulfill your duties as elected officials to safe guard our liberties now and in our future . Think of what is best for all of us not a select few . Boycott the companies, or contact them demanding an explanation. Take action. We've let these land thieves have a free ride for too long. Shame on the Supreme Court, of course, but the real culprits here are the individual legislators in Connecticut that passed this law in the first place. The Supreme Court simply confirmed that the Connecticut law is constitutional, but without the Connecticut legislators, we wouldn't have this problem in the first place. I've placed a call to arms on my blog describing my plan to hold these legislators individually accountable. How can we call ourselves patriotic Americans if we fail to end the career of every single Connecticut legislator who supported this law by having them voted out of office? At the very least we can show the children of these legislators, via the ensuing publicity, that they should be ashamed of their parents. While our troops are overseas fighting for freedom, these legislators sit in their air conditioned offices passing laws that take those freedoms away! They should be held accountable, and they should be banned from public office via a civically-minded electorate. The first step is finding the names of the legislators who supported this law (especially the prominent ones, but also the not so prominent ones), and Iâ€™m hoping our good friends from Connecticut will be able to do this (seeing as this happened in their own backyard). Beware of the redevelopment authorities , and their hue and cry about blighted properties. The end run around the blatant taking of a persons property for economic development to expand the tax base ,is redevelopment aurhorities and redevelopment plans. The sneaky property thieves will actually attempt to pass legislation that up front looks like they are attempting to protect your property , meanwhile leaving a one or two sentence loophole addressing blighted property. While up front we dont want a building that is so neglected that it cant be used by anyone other than the crack heads and homless ; eminent domain in the form of a redevelopment plan is not an acceptable answer. ALL Cities and local governments have Codes that address that situation. The Codes might need some streamling or tweaking, but they ALREADY have the tools to address blighted properties. Dont be fooled into potentially giving quasi governmental agency's the power to take your property if you dont want to sell. Eminent Domain has far surpassed its original intent. No longer is private property just seized for road construction and public utilities. Local governments have lately been condemning private citizens from their property just for tax purposes and political or economic gain. Legal cases are springing up all over the nation in which local governments are taking property away from one private party and giving it to another private or corporate party. In one recent case , a township in Ohio is trying to remove one of its residents through the use of eminent domain. The city wants to level houses in the area to make way for new condominiums, which will bring in more taxes. One retired couple is putting up a legal fight against the township and the matter will go before the courts. Lately however, the justice system has been in favor of eminent domain and its use to take property from one citizen, and give it to another. Most home owners would look at these acts as injustices against private property and individual rights protected by the constitution. Is there such a thing as private property in the US or does the government really own everything like in a communist society? Do you own your property or does the government? These are two questions that point straight at the heart of the eminent domain abuse issue.